Note: This item is not available for SHIPPING TO AK, HI, and PR. OR APO.FPO.DPO. This impeccable 30″ wall mount range hood, features a contemporary European design and its smooth brushed stainless steel. A three-speed, 343 CFM touch control panel lays across the front for easy use. Two LED lights on the front corners illuminate your cooking top for cooking throughout any time of the day. A two piece, easy-to-remove, dishwasher safe mesh filters keep maintenance to a minimum. The non-return air flap keeps heat from escaping when the hood is not in use. The range hood is made of stainless steel with a brushed stainless-steel finish. It also comes with a timer and a 12-hour clock for that punctual and accurate master chef. Our range hoods come with a one-year limited parts warranty for any defect which you might come across. For ductless recirculating installation, a carbon filter kit is available (sold separately: CF0011). 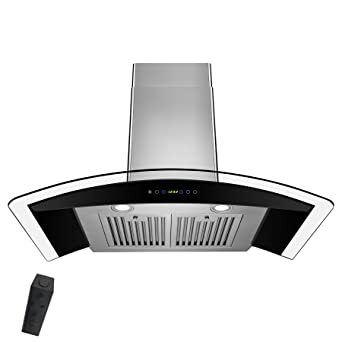 Range Hood Size: 30 inch Dimension: 29.5″ W x 19.75″ L x 42.25″ H Minimum Drop Down Height: 30.75″ Required Ceiling Height: 8 to 9 ft Duct Size: 6″ Flapper: Yes Airflow: 343 CFM Level of Speed: 3 Control Type: Touch Panel Noise Level: Less than 65dB at 343 CFM Lighting: LED Number of Bulbs: 2 Bulb Wattage: 1.5W Motor Wattage: 194WAirflow Efficiency: 1.77 Material: Stainless Steel Product Finish: Brushed Stainless Steel Voltage: 120V / 60Hz Filter Type: Aluminum Mesh Filter Number of Filters: 2 Ductless / Ventless: Optional (Sold Separately: CF0011) Remote Control: No Vent Location: Top Additional Chimney: Yes (Sold Separately) Certification: ETL Compliance with US and Canada Safety Standards Warranty: 1-Year Limited Parts Warranty Note: This item is not available for SHIPPING TO AK, HI, and PR. OR APO.FPO.DPO. Note: This item is not available for SHIPPING TO AK, HI, and PR. OR APO.FPO.DPO. Magnificent, Stunning, and incredible design. This AKDY 30″ wall mount range hood features a European modern contemporary design from glass and high quality stainless steel. The Wall mount range hood has 400 CFM and features 2x 1.5W LED lights. It also comes with easy-to-remove, dishwasher safe baffle filters to keep maintenance to a minimum. The non-return air flap keeps heat from escaping when the hood is not in use. It also comes with remote, gas sensor, timer, and a 12-hour clock; for that punctual and accurate master chef. The range hood is made of stainless steel with a black color finish and is accented with tempered glass wings. For ductless recirculating installation, a carbon filter kit is available (sold separately: CF0011). 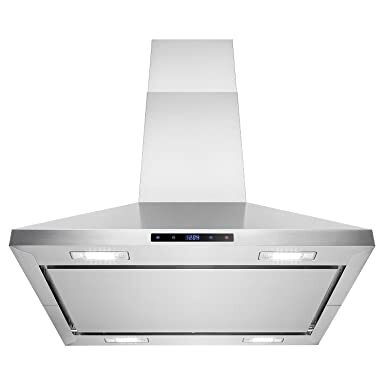 Range Hood Size: 30 inch Dimension: 29.25″ W x 18.5″ L x 42″ H Minimum Drop Down Height: 26.75″ Duct Size: 6″ Flapper: Yes Airflow: 400 CFM Level of Speed: 3 Control Type: Touch Panel Noise Level: Less than 65dB at 400 CFM Lighting: LED Number of Bulbs: 2 Bulb Wattage: 1.5W Motor Wattage: 193W Material: Stainless Steel Product Finish: Black Voltage: 120V / 60Hz Filter Type: Stainless Steel Baffle Filter Number of Filters: 2 Ductless / Ventless: Optional (Sold Separately: CF0011) Remote Control: Yes Vent Location: Top Certification: ETL Compliance with US and Canada Safety Standards Warranty: 3-Year Limited Parts Warranty Note: This item is not available for shipping to AK, HI, and PR. or APO.FPO.DPO. Note: This item is not available for SHIPPING TO AK, HI, and PR. OR APO.FPO.DPO. Designed with efficiency in mind, the AKDY RH0173 30″ island mounted range hood is a great addition to any kitchen. Its timeless minimalistic design has found its way into a variety of kitchen designs. This unit is best suited for ceiling heights ranging from 8ft – 9.5ft. This range hood houses an ultra quiet 343 CFM centrifugal motor dedicated to ridding your house of lingering aromas. Dual dishwasher safe aluminum grease filters help pull airborne grease while cooking. Made of high quality rust resistant stainless steel, these grease filters will outlast your home with regular cleaning. Four banks of LED illuminate the cooktop while a backlit touch screen display offers controls for lighting, timer, and 4 motor speeds. Furthermore, this range hood is covered by a three year parts warranty. The convertible system can be used ventless/ductless with a carbon filter for home with no available venting option. 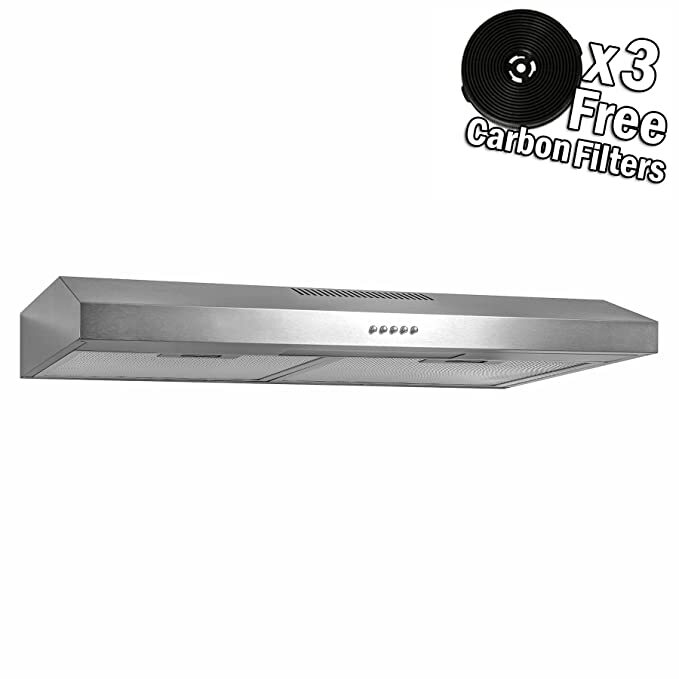 (Carbon filters sold separately) Specification: Range Hood Size: 30″ Dimension: 29.5″ W x 23.6″ L x 47.8″ H Minimum Drop Down Height: 28.8″ Required Ceiling Height: 8 to 9.5 ft Duct Size: 6″ Airflow: 343 CFM Level of Speed: 4 Control Type: Touch Panel Noise Level: Less than 65db at 343 CFM Lighting: LED Number of Bulbs: 4 Bulb Wattage: 1.5W Motor Wattage: 194W Airflow Efficiency: 1.77 Material: Stainless Steel Product Finish: Brushed Stainless Steel Voltage: 120V / 60Hz Filter Type: Aluminum Grease Filter Number of Filters: 2 Ductless / Ventless: Optional (Carbon Filter Sold Separately) Vent Location: Top Additional Chimney: No Certification: ETL Compliance with US and Canada Safety Standards Warranty: Three Years Parts Warranty Note: This item is not available for SHIPPING TO AK, HI, and PR. OR APO.FPO.DPO. Note: This item is not available for shipping to AK, HI, and PR. or APO.FPO.DPO. Clear unwanted odors from your kitchen without disturbing your family. Our AKDY RH0248 30 in. under cabinet range hood is outfitted with ultra-quiet fans that can barely be heard and a brilliant black touch panel. Suction is unmatched with 500 CFM of air flow available at your fingertips with a sleek touch panel for full access to all settings. Two front mounted LED lights can be enabled for added visibility. Three stainless steel baffle filters are included to trap grease and oils from entering your kitchen. Rounded corners ensure you’re not left scratched for added safety. Quickly control your range hood anywhere in the kitchen with the complementary remote for added freedom. 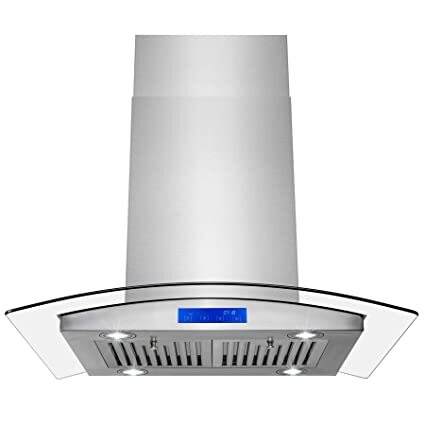 Range Hood Size: 30″ Dimension: 29.5″ W x 22″ L x 10″ H Duct Size: 8″ Flapper: No Airflow: 500 CFM Level of Speed: 4 Control Type: Touch Panel Noise Level: Less than 65db at 500 CFM Lighting: LED Number of Bulbs: 2 Bulb Wattage: 1.5W Motor Wattage: 233W Amps: 1.9 Material: Stainless Steel Product Finish: Brushed Stainless Steel Voltage: 120V / 60Hz Filter Type: Baffle Filter Number of Filters: 3 Ductless / Ventless: Vented Only Remote Control: Yes Vent Location: Top Additional Chimney: No Certification: ETL Compliance with US and Canada Safety Standards Warranty: 3-Year Limited Parts Warranty Note: This item is not available for shipping to AK, HI, and PR. or APO.FPO.DPO. Note: This item is not available for SHIPPING TO AK, HI, and PR. OR APO.FPO.DPO. If youre looking for the latest European and Italian-designed range hoods, look no further. This 30 in. wall mounted range hood is undeniably eurocentric with a clear glass canopy spanning its entire width. Easy to use touch panel enable the 3-speed fan capable of 343CFM of air flow and LEDs. Two stainless steel baffle filters are installed to superior filtration and ensuring unwanted grease and oils never leave your kitchen. For homes without an outside vent, a carbon filter kit(Sold Separately) is available for recirculating installations. 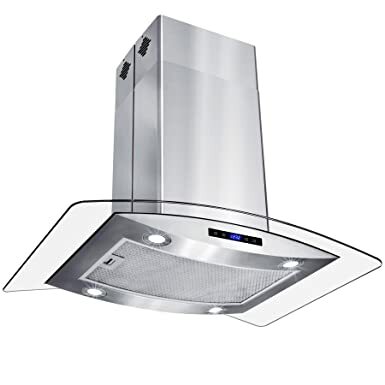 Range Hood Size: 30 inch Dimension: 29.5″ W x 18.5″ L x 42″ H Minimum Drop Down Height: 26.75″ Required Ceiling Height: 8 to 9 ft Duct Size: 6″ Flapper: Yes Airflow: 343 CFM Level of Speed: 3 Control Type: Touch Panel Noise Level: Less than 65dB at 343 CFM Lighting: LED Number of Bulbs: 2 Bulb Wattage: 1.5W Motor Wattage: 194WAirflow Efficiency: 1.77 Material: Stainless Steel Product Finish: Brushed Stainless Steel Voltage: 120V / 60Hz Filter Type: Stainless Steel Baffle Filter Number of Filters: 2 Ductless / Ventless: Optional (Sold Separately) Remote Control: No Vent Location: Top Additional Chimney: Yes (Sold Separately) Certification: ETL Compliance with US and Canada Safety Standards Warranty: 3-Year Limited Parts Warranty Note: This item is not available for SHIPPING TO AK, HI, and PR. OR APO.FPO.DPO. 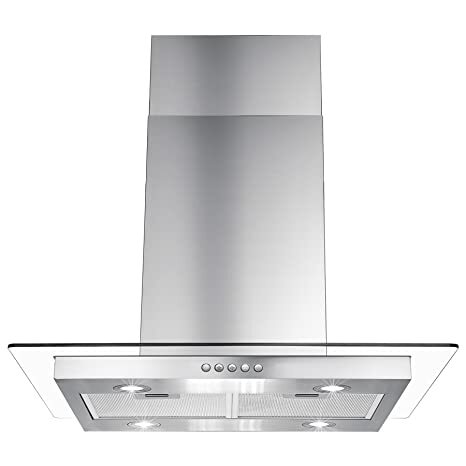 This AKDY 30″ island mount range hood features a contemporary Euro design in glass and stainless steel. The island mount range hood has 400 CFM and features 4 x 2W LED light. Easy-to-remove, dishwasher safe anodized aluminum filters keep maintenance to a minimum. The non-return air flap keeps heat from escaping when the hood is not in use. The range hood is made of stainless steel with a brushed stainless steel finish and is accented with tempered glass wings. Other features include: – Brand New lowest price guarantee. – Model No:RS-668is2-75. – Dimension: 29.5″W x 23.6″D. – Telescopic chimney fits 8-9 ft ceilings. – 3 speeds LED touch control. – Air Flow: 400 CFM. – Rated Voltage 120V. – Motor power 150W. – Noise level <65db. (quiet operation). – High quality stainless steel, 23 gauge. – Ventilation pipe inner Diameter 6″. – Teflon coated blades. – 3 years parts warranty. – Rated Frequency 60Hz (USA and Canada Standard). – For ductless option, you only need additional carbon filters available at http://www.amazon.com/gp/product/B004S96K6C for $29.9. – ETL safety approvals within US and CANADA. – Fast shipping to US lower 48 states and Canada via FedEx/UPS Ground. Note: This item is not available for SHIPPING TO AK, HI, and PR. OR APO.FPO.DPO. Note: This item is not available for SHIPPING TO AK, HI, and PR. OR APO.FPO.DPO. Heavy kitchen use is perfect for those that own the AKDY 30 KS0057 handmade kitchen sink. Featuring a curved farmhouse apron front, this durable stainless steel sink is smooth to the touch and is perfect for rinsing or preparing ingredients for a meal. The bottom of the unit is nearly flat, ideal for stacking dishware and preparing things for soaking. Sound deadening is found within to minimize any potential clanging. Consisting of 18 gauge folded T304 grade stainless steel, this kitchen sink is rust resistant and is sure to be a long lasting addition to your kitchen. 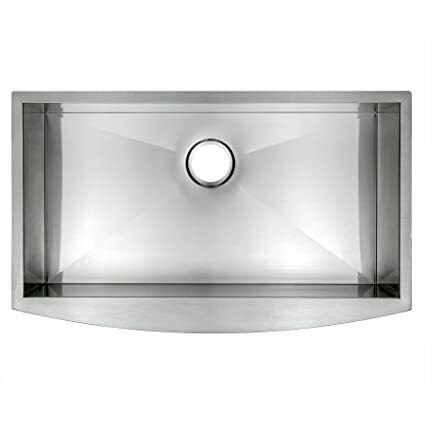 Kitchen Sink Mounting Type: Undermount Apron Sink Material: Stainless Steel Finish Type: Brushed Stainless Steel Number of Basin: 1 Sink Dimension(in. ): 30 L x 20 W x 9 H Basin(s) Size(in. ): 28 L x 18.25 W Overall Sink Depth: 9 in Stainless Steel Gauge:18 Drain Size: 3-1/2″ Punching Hole/Faucet Drilling Holes: 0 Sound Insulation: Yes Sink Weight: 28.6 lbs Warranty: 1 Year Limited Parts Warranty Note: This item is not available for SHIPPING TO AK, HI, and PR. OR APO.FPO.DPO. Note: This item is not available for SHIPPING TO AK, HI, and PR. OR APO.FPO.DPO. 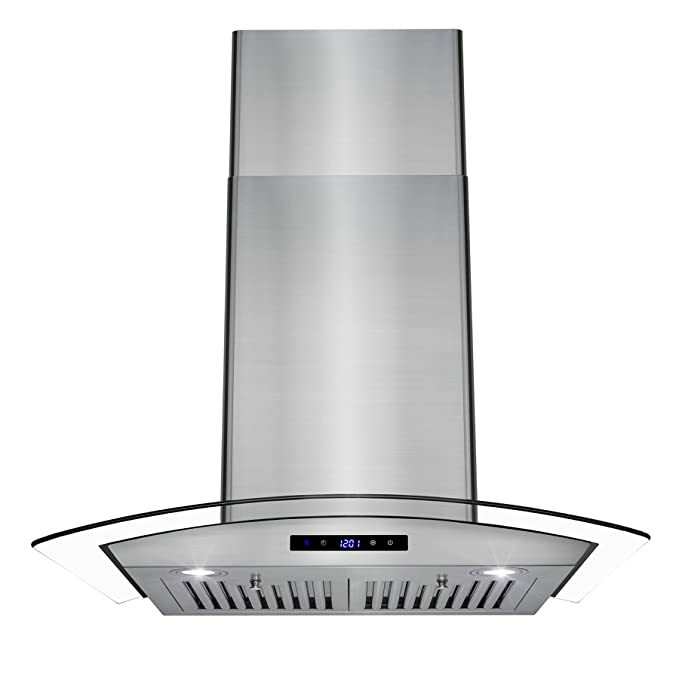 This thin profiled, AKDY RH0304 30 canopy island mount range hood is driven by style, featuring a straight flat clear glass, and brushed stainless steel. The shape of the range hood gives the kitchen a sense of modern and welcoming feel. The buttons in the center, give you three fan speeds which reach up to 400 CFM with minimal noise. The four LED lights on the bottom give your kitchen a lustrous bright light, for easy cooking during the night. While the two mesh filters help protect from unwanted oil particles, keeping your kitchen odor free. For ductless recirculating installation, a carbon filter kit is available (sold separately: CF0011). Range Hood Size: 30″ Dimension: 29.25″ W x 23.5″ L x 49.25″ H Minimum Drop Down Height: 30.25″ Required Ceiling Height: 8 to 9 ft Duct Size: 6″ Airflow: 400 CFM Level of Speed: 3 Control Type: Push Button Noise Level: Less than 65db at 400 CFM Lighting: LED Number of Bulbs: 4 Bulb Wattage: 1.5W Motor Wattage: 193W Material: Stainless Steel Product Finish: Brushed Stainless Steel Voltage: 120V / 60Hz Filter Type: Aluminum Mesh Filter Number of Filters: 2 Ductless / Ventless: Optional (Sold Separately) Remote Control: No Vent Location: Top Certification: ETL Compliance with US and Canada Safety Standards Warranty: 3-Year Limited Parts Warranty Note: This item is not available for shipping to AK, HI, and PR. or APO.FPO.DPO. Note: This item is not available for SHIPPING TO AK, HI, and PR. OR APO.FPO.DPO. 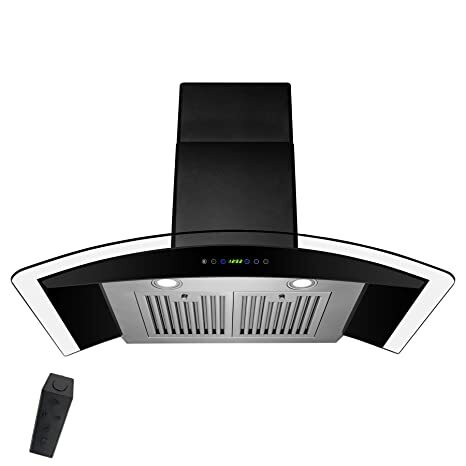 The AKDY 30″ wall mount range hood is popular for its sleek, slim, and stunning design. The innovative panel houses a sliding touch control, and features a 400 CFM blower and 3-speed fan, operated with intuitive digital controls. Two 2-watt LED light bulbs are pre-installed, offering elegant illumination for your cook top. Two stainless steel baffle filters has a wide filtration area for quick clearing of smoke and fumes. Though designed for ducted use, it may be converted to a ductless (recirculating) range hood when you order an optional charcoal filter set. 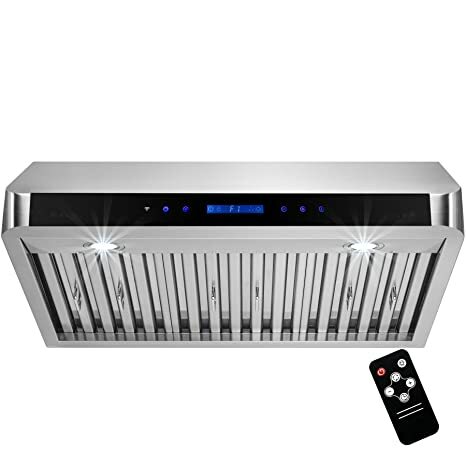 The ultra quiet fan keeps noise levels under 65db, so the brushed stainless steel adjustable chimney and clear tempered glass can add beauty and function to your kitchen without any disruption. 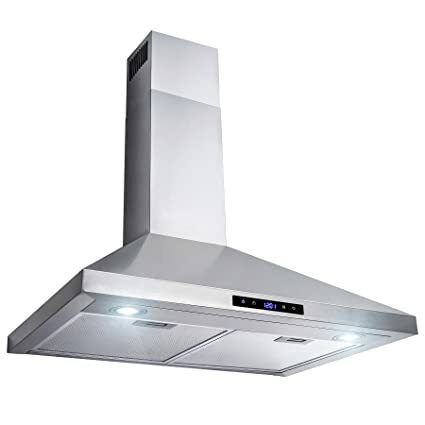 Range Hood Size: 30 inch Dimension: 29.5″ W x 18.5″ L x 42″ H Minimum Drop Down Height: 26.75″ Required Ceiling Height: 8 to 9 ft Duct Size: 6″ Flapper: Yes Airflow: 400 CFM Level of Speed: 3 Control Type: Touch Panel Noise Level: Less than 65dB at 400 CFM Lighting: LED Number of Bulbs: 2 Bulb Wattage: 1.5W Motor Wattage: 193W Material: Stainless Steel Product Finish: Brushed Stainless Steel Voltage: 120V / 60Hz Filter Type: Stainless Steel Baffle Filter Number of Filters: 2 Ductless / Ventless: Optional (Sold Separately: CF0011) Remote Control: Yes Additional Feature: Gas Sensor Vent Location: Top Additional Chimney: Yes (Sold Separately) Certification: ETL Compliance with US and Canada Safety Standards Warranty: 3-Year Limited Parts Warranty Note: This item is not available for shipping to AK, HI, and PR. or APO.FPO.DPO. The wall-mounted range hood has 400 CFM and features 2x30W halogen lights which will illuminate all your cooking activities. It also comes with easy-to-remove, dishwasher safe stainless steel baffle filters that will keep maintenance to a minimum. The non-return air flap keeps heat from escaping when the hood is not in use. The range hood is made of stainless steel with a brushed stainless steel finish, for certain this will make one piece of classic appliance for your kitchen. Other features include: Dimensions: 29.8″ X 18.9″ Brand New lowest price guarantee Model No: AZ-B02-75N Telescopic chimney fits 8-8.5 ft ceilings Rated Voltage 120V Rated Frequency 60Hz (USA and Canada Standard) Motor power 198W Noise level <65db. (quiet operation) Teflon coated blades 3 Years parts warranty ETL safety approvals within US and CANADA Note: This item is not available for SHIPPING TO AK, HI, and PR. OR APO.FPO.DPO.